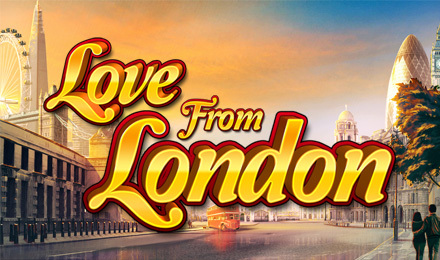 Take a whistlestop tour of London to soak up the iconic sights and play Love from London Slots today. The reels are packed with iconic landmarks, kissing couple Wilds, Guard Scatters, bonus features, FREE spins, multipliers and big wins! Soak up the iconic sights and sounds of London and play Love from London Slots today from Random Logic at Vegas Spins. This 5 reel and 20 payline slot offers a whistle-stop tour of London and the reels are jam-packed with iconic landmarks, from the Shard and London Eye to Red Buses and Big Ben. Romance is in the air, so if you spot the kissing couple wilds, they will substitute for other icons and can multiply your bet winnings. If the Beefeater Guard Scatter marches onto the grid, he will reward you with 15 spins, bonus features and multiply your wins. So take a whirlwind tour of London today to discover why all the crowds flock to the capital to spin their fortunes!